Learning how to take optimal routechoices in Estonian terrain is in the back of the mind of many elite runners with the World Championships coming up in Estonia in 2017. Today’s leg in Route to Christmas addresses that – the chosen leg is the 6th leg in the M21E course from Euromeeting 2015 Long at September 26th 2015. The leg has been suggested by several – among others Andreas Rüedlinger, Borger Melsom and Markus Puusepp. And a big thanks to Johan Runesson (winner of the race and fastest on the leg) and Timo Sild (second in the race, expert in Estonian terrain but still did not take the optimal routechoice here) who have provided us with some interesting analysis from the leg. – As Estonia will have WOC in 2017, I decided to go to Euromeeting to get a first insight in how the terrains were. The Swedish squad went for some trainings on the day before Euromeeting, so that we should be a bit prepared before the first races. As the sprint was the day before the long distance, this was the first competition in the forest. The leg is as usually first provided without routes – you may take a look at it and think about how you would attack this leg (if the image is too small, you may click on it to get it larger). 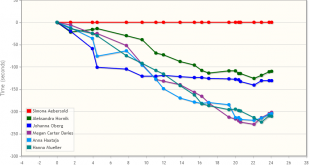 Then you can take a look at how the best runners have solved this leg below. As you can see from the illustration, going straight was clearly fastest here – although there are significant time differences between the ones going straight. Runesson solved the task best, and was more than 20 seconds faster than Ridefelt. Sild runs left and loses more than 1:30. – My first thought of the training and also the model event had been that it is quite dense and your sight was limited but still there was good runnability in the green areas and also in the marshes, Runsson explains. – Also I got the impression that the terrain and the maps reminded me of my terrain at home were I ones started orienteering and my conclusion was therefore that I should try to run the shortest way whenever possible. Before this leg I had made a stupied mistake on the first long leg, so I was a bit angry on myself and had been pushing hard after the mistake and when I saw the leg that was waiting. I just checked that there were no obvious routechoicse around or on a path. When I couldn’t find any, I decided to go straight. I just focused on pushing and checked the compass because I thought that it was not important to be aware of knowing exactly where I was. Just before the last marsh I located for the first time exactly where I was and from there I could still go fast to the control. I like this type of legs where there are more focus on how to go fast and don’t get stuck on the way in details. Of course the terrain is fast but still we are not running on tracks so you have to use other muscles then the normal on lon legs with tracks! Comparing Runesson’s pace on this route with another runner with approximately the same speed – Finnish Mikko Siren, you can see that until approximately half of of the leg they were equal in time, but from there on Runesson chose a better route further to the left which is shorter, avoids one small hill and avoids running along the edge of a marsh which seems to be slow here. This micro-routechoice on the second part of the leg costs Siren 45 seconds. 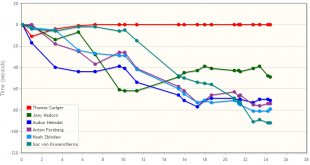 Comparing micro-routechoices of Runesson with other runners show a similar picture – it is very easy to choose between half a minute and a minute here if your micro-routechoice is not optimal. 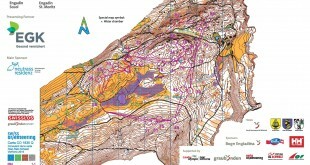 – The 5th control is very near to a road and therefore two possibilities crossed my mind. First, it’s a trap set by the course-setter to lure competitors onto the road and to take the longer and slower routechoice. Second, it’s a trap set by the course-setter to make the competitors think that the road is suspiciously close and to opt for the routechoice going straight. As evident from my self-made statistics, I’m more often ready to take a going-around-on-a-road routechoice than not. Sometimes it pays off, sometimes not. On this specific occasion it didn’t, mainly because of the very bad runnability in the middle of the leg when crossing the uncrossable marsh. And a comparison of speed for the various routes. Here you clearly see where Sild loses time when crossing the uncrossable marsh, and also how there are many places on the straight routes were you can get “caught” and lose some time. 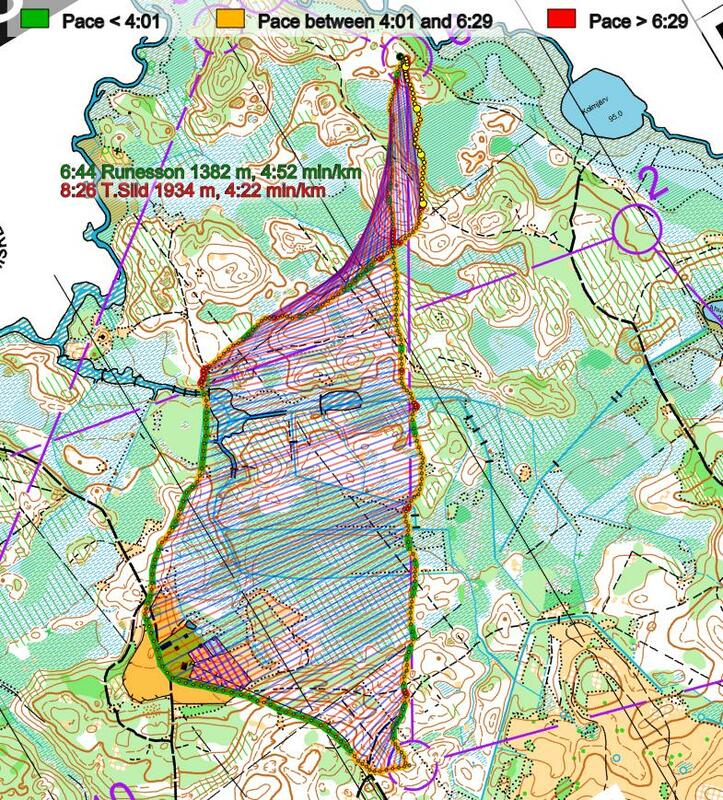 Lauri Sild also has some additional thoughts about route choice in Estonian terrain:< – For some contemplation for the readers, an example from Route to Christmas day 16 year 2012. After the competition we calculated with Lauri that taking the long way around from the left, which doesn’t even fit in the map cut-out, would have been 1-1,5min faster than the fastest time run on that leg. Or an example from an international event in Estonia that probably a few remember. At the 1998 World Cup long distance Bjørnar Valstad took a routechoice going around that admittedly surprised even the course-setter and almost decided the competition in his favour, if it only weren’t for the wrong going around routechoice on a previous long leg ;). [Editors comment: See course below in the 90’s web image quality – the route in question is probably the route to 14. BV is Bjørnar Valstad. SS is Sixten Sild]. The interested reader can also take a look at the WorldofO article from Euromeeting 2015 with some more analysis of certain legs. Next Orienteering Achievement of 2015: Vote Now! Why wasn’t the routechoice to the right included in the summary or analysis ? As seen from the density map there are many (like me) who favoured a variant of this, using the paths all the way directly into the control. It’s long and around for sure, but not much more than the left choice and the entry is better end easier. Thanks a lot for your comment, EH! 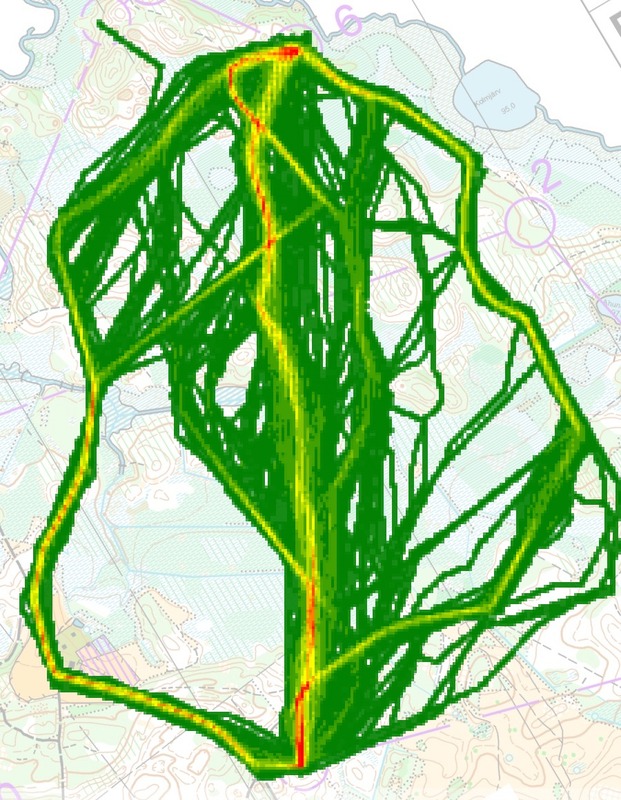 The reason the route to the right is not included is that it was not ran by the GPS-tracked runners. I did also not really consider it, but see now that it is an alternative. I agree with you that it should be at least on par with the route around to the left (which was a lot slower than direct, but still). Agree with EH. Right route has a lot more path than left path option. maybe 75% on path versus 50% on the left option. Maybe Timo S could comment on this choice.